Any child of the 1990s surely recognizes the bold colors, eerie illustrations, and signature drip lettering of R.L. Stine’s flagship series and crowning achievement, Goosebumps. Over the course of 62 books, the Midwestern author earned himself the title “Stephen King of children’s books” by launching a TV show, creating over two dozen spin-off series of books, and scaring countless kids out of their pants in the process. And while he has since written over 300 additional stories, the original line of Goosebumps books will always stand tall as the saga that introduced an entire generation to horror. But what bored goblin has time to read 62 books? Well, this one… but I’m here to help. In honor of his 75th birthday, here are the 13 greatest hits from R.L. Stine’s prolific literary career. But readers beware… you’re in for a (pretty silly, frivolously entertaining, masterfully suspenseful, and sometimes even genuinely heart-stopping) scare. A highly relatable protagonist, equally male and female. A core friendship between the main characters — usually a boy and a girl, though always platonic… they’re just kids, after all! A villain that, more often than not, isn’t what you think. And of course, a twist at the end. And it all started with Welcome to Dead House. 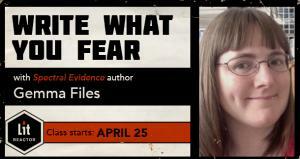 The first book in Stine’s series remains one of his best and scariest. A story about isolation and also vampiric zombies, it played on every kid’s fear of being the new kid in town: how much worse would it be if that town was entirely populated by the undead? Stine would eventually abandon some elements used in his first book —it was particularly violent and disturbing, featuring dog-murdering mutants on top of heel turns from the protagonist’s so-called friends. But ultimately, it set a decisive tone for everything else to come. Despite the Chucky the Doll comparisons (or the Romero-referencing title), Slappy the Dummy is no knockoff. He is Goosebumps’ arguable mascot: the most recognizable monster out of a series that added a new villain to its Rogue’s Gallery with each book. And make no mistake, Slappy is pretty monstrous: his obsession with turning preteen girls into his puppets and slapping them when they refuse takes on a whole new meaning to young readers as they grow up. So it’s easy to forget that, despite the cover, Slappy was not the main antagonist of the first Night of the Living Dummy (not like anyone remembers “Mr. Wood,” the evil dummy from the first book). It took until the second for him to really hit his stride, but once he did, the series never went back. However, what makes this book truly shine is the unusually poignant story at the center about Amy Kramer, a forgotten middle child who never has anything to say on “Family Sharing Night” because she isn’t talented like her sister or in the spotlight like her brother. Who ever said Goosebumps was only for kids? Monster Blood, the third installment on our list and the series itself, is a franchise within the franchise. There are plenty of titles with sequels — The Haunted Mask, Deep Trouble, the Mummy books — but none maintain the same continuity as these ones (Monster Blood IV also holds the distinction as the final book in the original series). Thus, this saga of Evan Ross, his best friend Andy, and a mysterious green slime with magical properties has become synonymous with the series. 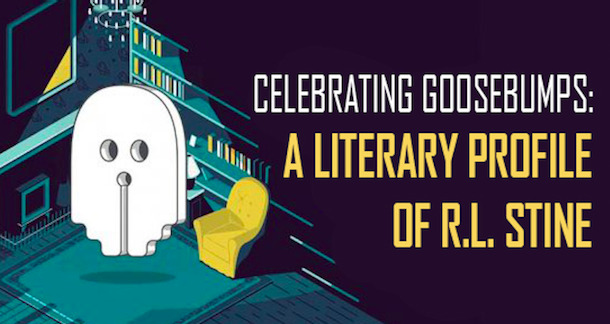 These books also had a particularly unsympathetic cast of characters — so much so that R.L. Stine replaced them entirely in the standalone Monster Blood for Breakfast. From Evan’s neglectful parents to the relentless bully Conan Barber, these stories are devoid of hope in a way that not many children’s stories are. That itself is a testament to Stine’s bold refusal to pull punches in his series. This one simply gets points for originality: iParty meets some sort of hybrid of a Homunculi and that facehugger from Alien. A girl named Carly-Beth stumbles upon a mysterious shop, buys a Halloween mask forged in the fires of human sin, puts it on, and it attaches itself to her face. It starts to turn her evil, she goes into full badass mode, and vanquishes it with the power of love. At the end, she finally gets it off, only for her brother to put it on. You know, your typical story. A real crowd pleaser to everyone except game theorists, this one features a demented version of Hide & Seek meets Tag… except the losers are eaten by purple gorillas (by the 43rd book, R.L. Stine was really flexing his creativity). Extra points to anyone who can actually decipher the rules of the game, but the book itself spends more time expertly setting up its twist: it really is just a game to the creatures. Outside of it, they are more or less the perfect gentlemen. As a rule, you really can’t judge a book by its cover — not a Goosebumps book, at least. The Jaws-inspired imagery on the cover of Deep Trouble masks the much more complex (and, frankly, interesting) plot that comprises the rest of the book. The perfect example of R.L. Stine’s inclination to make humans the real monsters, this is a story about a boy rescuing a friendly mermaid from a mad scientist (employed by madder mercenaries). Fortunately, the bad guys get theirs — though we won’t spoil the rollicking ending for you. Without a doubt, this one of the most crowd-pleasing entries in the entire franchise. Evil cameras, useless parents, and a (un)healthy dose of body horror construct this follow-up to one of the very first Goosebumps books. The hapless creator of a camera that curses anyone unlucky enough to have their picture taken by it spent much of the first book trying to destroy the camera… only to die first at the hands of Greg, the supposed protagonist. Greg returns for this one, and given that previous outcome, it’s hard to feel bad about his fate, even when he puts on three hundred pounds in one night and is still sent to school the next day by his parents, who blame the weight gain on allergies. The camera alters people’s destinies, but Greg’s fate was always in his own hands — and he continued to show off the camera in spite of that. Quite the moral for a children’s book. Tormented by a living snowman in a town near the Arctic, Jaclyn recalls a nursery rhyme her father used to tell her: Beware the snowman, he brings the cold. Turns out, this is no coincidence — the snowman was brought to life by her father, a sorcerer she’d mistaken for a local hermit who returns at the end of the story to defeat it. So this one features the greatest familial twist this side of Cloud City… and also a happy ending to boot. An Aesop-esque morality tale set on Halloween, Attack of the Jack O’Lanterns serves to warn kids not to… trick or treat with strangers? Eat too much candy or else they’ll be eaten by a gang of man-eating, fire-breathing aliens with pumpkins for heads? The intended takeaway isn’t exactly clear, but the wild story that gets you there is endlessly compelling nevertheless. 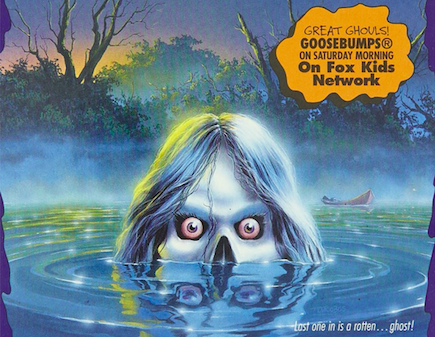 If this isn’t the scariest entry in the entire series, it undoubtedly boasts the scariest (albeit most unrelated) cover: a skull with bloodshot eyes half submerged in icy water. It also remains surprisingly and sadly relevant, following the story of an awkward and implicitly autistic girl tormented by her irritated bunkmates who winds up befriending a ghost that eventually kills her. If nothing else, Stine knew how to make parents second guess enrolling their children in summer camp. Spoiler alert! This book ends on the twistiest ending of a series that loves twists — and it might be worth experiencing for yourself. But if your curiosity is crushing, here’s the gist: the protagonist Hannah is haunted, by fiery night terrors and possibly her neighbor, Danny. Also, it features a postman with a shotgun and a penchant for child endangerment. So spoilers or no, it’s worth reading, anyway. This one is notable for having practically no antagonist at all. Though the eponymous ghost was supposedly quite the brat, nothing suggests he deserved to be decapitated by a spectral sea captain who doesn’t even appear in the action of the book. He goes so far as to help the children searching for his head, and the bulk of the book turns into a tour of his castle. Sure, it’s not a master class in conflict, but it’s a nice break from the bleaker entries in a bleak series. When it comes to R.L. Stine, writing isn’t just about giving goosebumps. 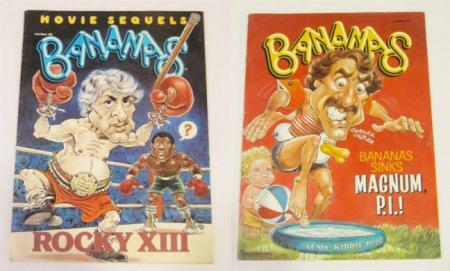 In fact, his life’s goal at age 30 was to have his own humor magazine, and with Bananas, he did exactly that. It only ran for about 10 years, but contained some of his best (and, naturally, his funniest) writing. And of course, it’s a far cry from the horror he became known for. You can check out a few old issues here. Formula or no, Stine remains one of the most prolific and unexpectedly profound children’s writers to ever live. And with all due respect, he’s not the “Stephen King of children’s books.” King is the R.L. Stine of suspense. 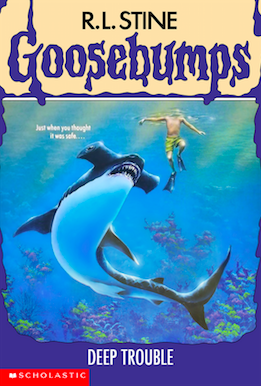 I loved Goosebumps. It was intense horror at age 9. Even some parents wouldn't allow goosebumps for birthday gifts when I was in elementary. That was also shocking. Thank god I got goosebumps in the 90s before the internet and netflix!